Analytical R&D teams are thought of as a core facility within a company. 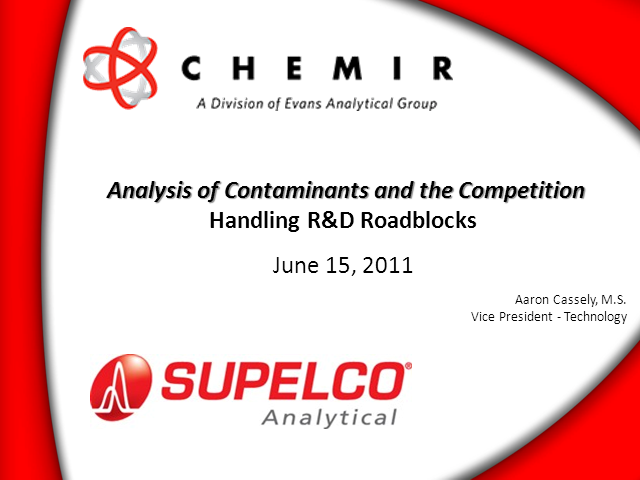 On top of their regular R&D duties, they are often asked to solve production problems, ranging from identifying a contaminant to investigating a competitor’s new product. Learning how to approach these challenges and considering the use of resources beyond your laboratory can save both time and money. Three case studies will be presented. The case studies involve method development for sub-ppm detection, identifying an off-odor in food, and the detection of a low level pigment. A focus on the specific analytical technology will be presented in the case studies.